Xiaomi has launched its first all-metal devices in Beijing today: the Redmi Note 3 phone and the Mi Pad 2 tablet. The 5.5-inch phone runs on Xiaomi’s Android-based MIUI 7 OS and features a 1080p display, a fingerprint sensor on the back and a massive 4,000mAh battery. It’s powered by a MediaTek Helio X10 processor and 2GB RAM. There’s also a 13-megapixel rear camera, a 5-megapixel front camera and support for dual 4G SIMs. The handset is available in silver, gold and dark gray in your choice of 16GB storage with 2GB RAM for RMB 899 ($140) or 32GB of space with 3GB RAM for RMB 1,099 ($172). That pegs the Note 3 in a competitive space along with other budget phones like the $179 Moto G and the older $168 Honor 4X — but it offers a number of benefits over its rivals like a sandblasted metal body, the ability to secure your device with your fingerprint and a significantly larger battery. Xiaomi also unveiled the Mi Pad 2, the successor to the company’s popular tablet. The new tablet is the same size as its 7.9-inch predecessor, but is said to be 18 percent thinner at 6.95mm and 38g lighter at 322g. 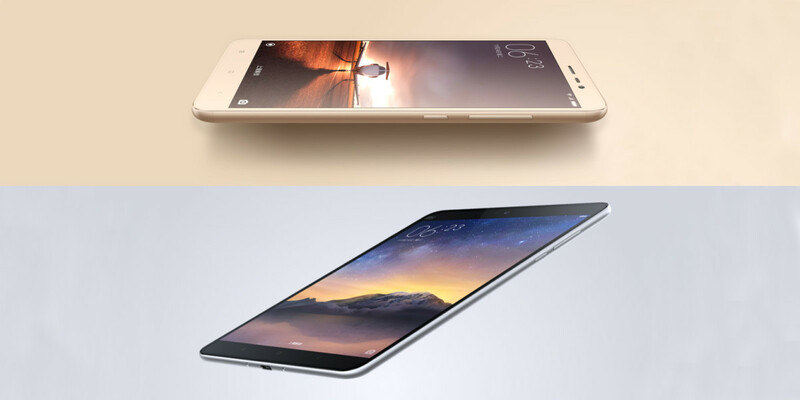 The Mi Pad 2 houses an Intel Atom quad-core 2.24GHz processor and 2GB RAM. On the front, you’ll find a 2048×1536 pixel display at 326ppi as well as a 5-megapixel camera. On the rear is an 8-megapixel shooter and a 6,190mAh battery that supports fast charging. Xiaomi says you can expect 12.5 hours of reading or video playback time on a full charge. The tablet also features a USB-C connector and a reading mode that cuts blue light to reduce eye strain. The 16GB model is available for RMB 999 ($156), while the 64GB version costs RMB 1,299 ($203) — both in either champagne gold or dark gray. In addition to an Android-based MIUI 7 version, Xiaomi will also make a Windows 10 edition of the Mi Pad 2 available in late December. It’ll be interesting to see if the move to carry Microsoft’s OS will help the company take on tablet makers like Asus and Dell. Both devices will go on sale in China on November 27 via Xiaomi’s site and its Mi Home outlets in the country.